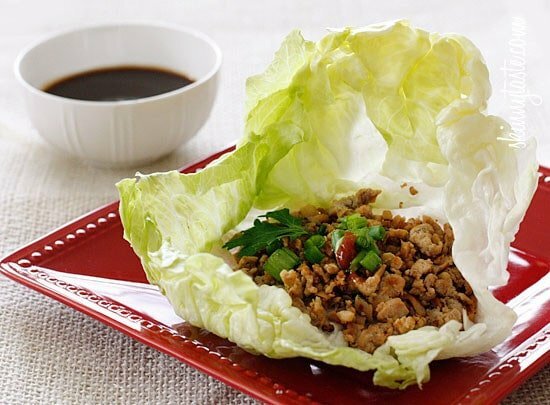 These quick and easy authentic Asian Chicken Lettuce Wraps are so delicious, made with sautéed ground chicken, shiitake mushrooms and water chestnuts seasoned with Asian spices served in a crispy cold lettuce leaf with a spicy hoisin dipping sauce. Some of you probably know how much I love using lettuce leaves as a wrap for everything from Turkey Taco Lettuce Wraps, and Buffalo Chicken Lettuce Wraps to BLT Lettuce wraps. This recipe was ever so slightly adapted from my friend Bee, of Rasa Malaysia’s first cookbook, Easy Chinese Recipes: Family Favorites From Dim Sum to Kung Pao. Whether you are celebrating The Chinese New Year, The Superbowl, or just having some friends over, I highly recommend making these… double or triple the recipe for a large crowd! Look for lettuce leaves that are large enough to hold the filling. I like to use iceberg lettuce for larger cups. Romaine lettuce and baby romaine are also great. The leaves of butter or boston lettuce are smaller, but also wonderful. If you prefer, you can turn this into a big chopped salad by simply serving this over a bowl over chopped lettuce. If you want to turn this into a main dish, add some steamed rice and serve each wrap with rice and chicken, it’s very good! 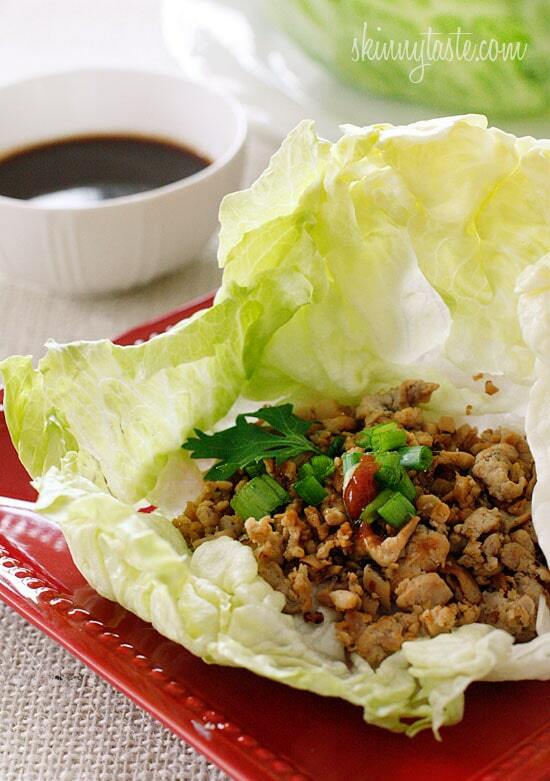 These quick and easy authentic Asian Chicken Lettuce Wraps are so delicious, made with sautéed ground chicken thighs, shiitake mushrooms and water chestnuts seasoned with Asian spices served in a crispy cold lettuce leaf with a spicy hoisin dipping sauce. Place mushrooms in hot water to soften a few minutes. Remove stems and chop fine. Combine soy sauces, oyster sauce, 1/2 tsp sesame oil, rice wine, sugar, and pepper in a bowl. Combine ground chicken (I put the chicken in the food processor), softened mushrooms and water chestnuts into a bowl. Pour over chicken; toss. Let marinate for 15 minutes. Mix Spicy Hoisin Dipping Sauce ingredients in another bowl. Set aside. Heat remaining sesame oil in a wok or skillet over high heat. Add garlic; cook until golden, about 10 seconds. Add chicken mixture; stir fry until browned, breaking the chicken up as it cooks, about 4-5 minutes. To serve, spoon 1/4 cup of the chicken into each lettuce leaf. Garnish with scallions and a spoon a little Spicy Hoisin Dipping Sauce onto each one. Gina, you and this recipe are so awesome! I made this for lunch yesterday and today and already can’t wait to make it again (soon!) Day 2 was even better than day 1. I didn’t have oyster sauce but used fish sauce instead. Next time, I will toss in some shredded cabbage while cooking to add some low calorie bulk. Thinning the hoison sauce with a little water is brilliant. Loved it!! I’m going to eat it for the next two nights. Tks for sharing. My husband is allergic to fish.. can I use something instead of oyster/fish sauce? They make vegetarian versions. .i bought them on amazon as my husband and I don’t like fish and fish sauce scares us…. I don’t think the oyster sauce is a must in this recipe. I’ve made it with and without it and it’s great either way. Fantastic recipe! So flavourful and delicious! This is one of my go-to meals when I need something fast and amazing! Made these tonight. It was so good. I don’t like mushrooms so I added more water chestnuts. It was delicious. I will be making these again! Doubled the recipe. Ground my own chicken thighs which were skinless and boneless. A very delicious recipe. I’ve made with ground turkey as well. Very good. Sub celery for the water chestnuts and often add finely chopped cremini mushrooms. I make this often and never tire of it. Thanks for another great recipe! I made this tonight. I used chicken breast instead of thighs. I also sprinkled some chopped cashews on top. They were awesome! Gina, I’m curious if I made this with the ground chicken breast, would it be less points do you think? Or is the majority of the points from the sauce material? 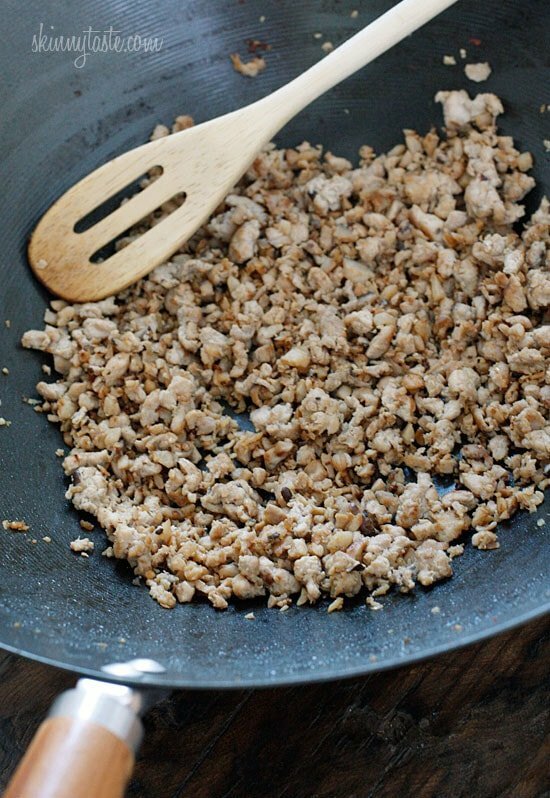 I made this with ground chicken breast and it tasted just fine. The meat was a bit paler but the flavor was the same. My family loved it. I calculated 2 points per serving instead of 3 when using chicken breast. It still tastes amazing! Is Japanese sake(Miri) the same as rice wine? Is sweetened sake the same as rice wine? I have made these a bunch of times and I love them. Have you ever tried freezing the meat mixture? I freeze this all the time….freezes great! Lisa, do you freeze before or after cooking? If I buy 1lb of ground chicken or turkey will I need to double the recipe for everything else? The recipe only calls for 8oz. Thanks! I have not had any luck finding the dried mushrooms. Has anyone used fresh? I just used fresh cremini in mine! This has become an absolute favourite in our home!! We never get sick of it. thank you! Time and time again, these are a home run in our house!! In case anyone is curious, these work great with packaged ground chicken, as well as lean ground turkey. I did it with 93% ground turkey and they ended up being only 2 Smart Points each- can't beat that! ive made this 10 times and is a total hit. i quisinart up a whole package of mushrooms with the water chestnuts so its a little more veggie heavy. i use ground turkey. 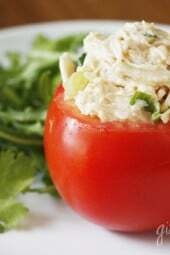 its an excellent low cal high protien dinner option even my husband requests. delish! I made a notable change and it was fantastic, so I'd like to share: I doubled the sauce that marinates(but only used 2tsp sesame oil) the chicken, added a whole shredded zucchini, 1/4th of a small cabbage shredded, and a whole diced onion and sauteed these into the chicken after the chicken had browned. also used some corn starch to thicken the sauce as the extra veggies created lots of extra liquid. I am so repeating this next week! I followed your additions and it was amazing and so filling!!!! If I can't find oyster sauce, what could replace it? Going to make this next week! I too Love the Pf chang wraps. need to try these for sure Not a big fan of water chestnuts,can you tell they are in there if chopped really tiny. or do they just add more of a crunch? Sue I don’t care for water chestnuts either and always sub celery instead. Great recipe! 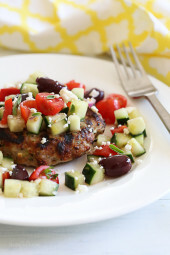 Next time I make this, I'll sub in lean ground turkey. A great substitution for water chestnuts is sliced almonds. I've made these twice now. The first time, I used store bought ground chicken. The next, turkey. Both turned out great! I pair them with steamed bao buns. Made these tonight. They were a huge hit all around. Super yummy!